This badge was issued to Vitor Henckel on 04 Jan 2018. This badge earner has a foundational understanding of the Watson Conversation service. The individual can articulate what activities are involved in an implementation, project management requirements, and requirements validation. 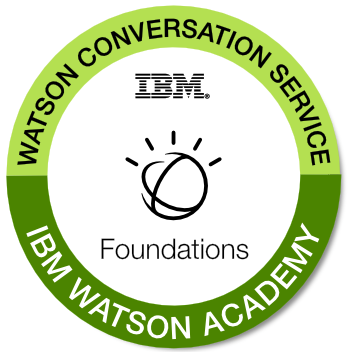 They can explain best practices for modeling a Conversation solution utilizing the Watson platform. Successful completion of the Designing Conversational Solutions course. Please note: This badge is no longer available. The Watson Conversation Service has recently been replaced by the Watson Assistant Service. If you would like to receive a badge on the new updated courses, please visit http://ibm.com/training/watsonacademy, log into the site, and search for Watson Assistant.